孙藤芹, 汪文俊, 梁洲瑞, 刘福利, 孙修涛, 曹原, 王飞久. 紫菜养殖对养殖水体中细菌多样性分布及环境因子的影响[J]. 渔业科学进展, 2019, 40(2): 115-121. DOI: 10.19663/j.issn2095-9869.20180326001. Sun Tengqin, Wang Wenjun, Liang Zhourui, Liu Fuli, Sun Xiutao, Cao Yuan, Wang Feijiu. Effect of Pyropia Farming on Bacterial Communities and Marine Environmental Factors[J]. Progress in Fishery Sciences, 2019, 40(2): 115-121. DOI: 10.19663/j.issn2095-9869.20180326001. Corresponding author: WANG Wenjun. E-mail:wjwang@ysfri.ac.cn. Abstract: Pyropia is one of the most economically important seaweeds, which is mainly cultured in China. In recent years, water quality deterioration caused by long-term and intensive culture have led to problems for Pyropia aquaculture, such as disease outbreaks, decreased yields, and lower product quality. Microorganisms are important components of the environment and have important effects on the growth of other organisms. 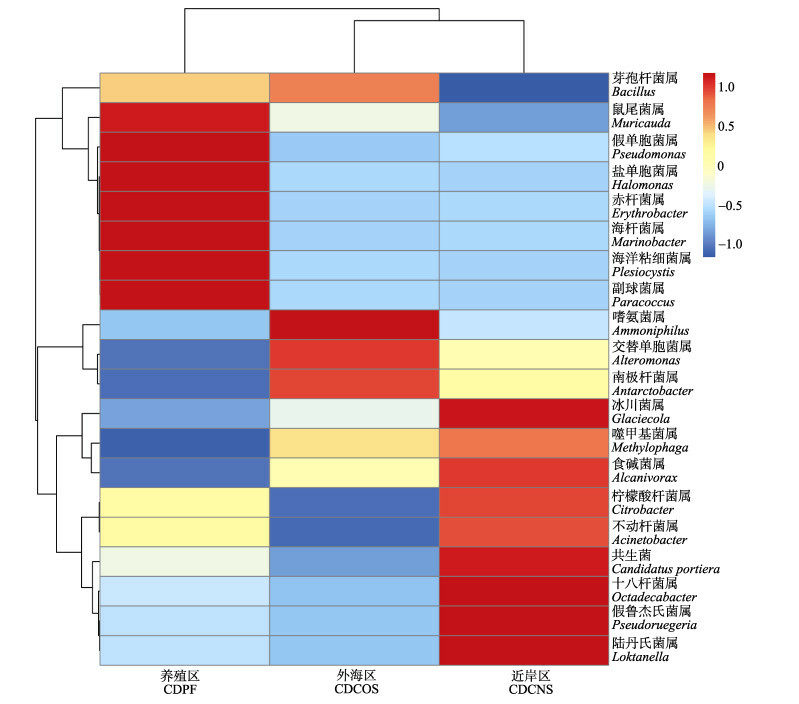 In this study, the microbial community structure in a Pyropia yezoensis aquafarm in Changdao, China, was studied using 16S rDNA-based high-throughput sequencing technology. Whether there were correlations between different environmental factors and the abundance of some predominant bacterial taxa was also tested to explore the environmental impacts of Pyropia farming. The results showed that microbial diversity was rich in the surveyed marine area. The abundance of Proteobacteria was the highest among all of the identified bacterial phyla. When the Pyropia farming area was compared with nearby non-farming areas, it was found that the highest abundances of microbial species occurred in the near-shore area (CDCNS), followed by the Pyropia farming area (CDPF), and the microbial diversity was the lowest in the offshore area (CDCOS). Cluster analysis of the samples was carried out based on Bray-Curtis similarity coefficient values calculated among them. The microbial community structure of CDCNS and CDCOS formed a clade that was separated from CDPF. Furthermore, the twenty genera with the highest abundances were used for a further cluster analysis, and the results showed that CDCNS and CDCOS clustered together, with more genera being especially abundant in CDPF. The predominant bacteria from CDPF included Muricauda, Pseudomonas, Halomonas, Erythrobacter, and Marinobacter. Suspected pathogenic bacteria of Pyropia, such as Pseudoalteromonas tetraodonis and Pseudoalteromonas citrea, were not identified in the surveyed areas. Indeed, the abundance of the genus Pseudoalteromonas was lower than 0.1%, suggesting that the environment was safe for Pyropia farming. Dissolved oxygen (DO) and pH decreased gradually from CDCNS to CDCOS, and TSS increased gradually from CDCNS to CDCOS. The content of NH4+-N was the lowest in CDPF and the highest in CDCOS, while the salinity was the highest in CDPF. Correlation analyses showed that there were relationships between environmental factors and environmental microorganisms. The abundance of Ammoniphilus was positively correlated with the content of NH4+-N, which was the lowest in CDPF and the highest in CDCOS. The distribution of Halomonas was related to salinity, and the abundance of Halomonas was significantly higher in CDPF than in the other two areas.Halomonas functions in denitrification, and thus can promote the conversion of N from an oxidized state to reduced forms that are more easily absorbed by algae. In conclusion, this study represented the first report of the structure of the microbial community in a Pyropia aquafarm and its correlation with environmental factors. The results showed that farming Pyropia had significant influences on the environmental microbial community, which were closely related to variations in environmental factors caused by Pyropia farming. Such changes in environmental factors and microbial structure had corresponding effects on Pyropia growth. The mechanisms of these interactions between environmental microorganisms and Pyropia growth should be further investigated in the future.